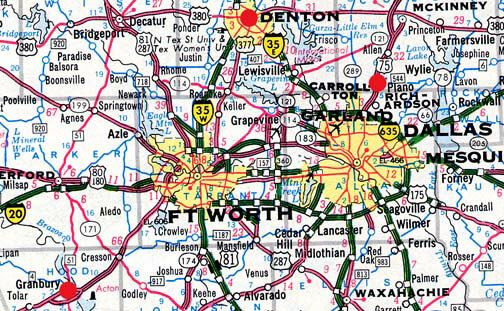 Granbury in lower left corner is 32 miles southwest of Fort Worth, Texas. The other red circles in Denton and Plano are sites where half cats and missing cats have been reported in the past. September 26, 2007 Granbury, Texas - It was only three weeks ago that I was reporting about half cat mutilations in Destin, Florida, and Alberta and Ontario Canada. [ See 090407 Earthfiles.] And since April of 2007, there have been other half cat mutilation reports in Waco and Corpus Christi, Texas. [ See 040907 Earthfiles.] This cat mutilation mystery which has been reported over at least four decades in the United States, Canada, England and Australia.